Our Cold Higham correspondent spotted this informative notice that the Highways Agency have introduced. 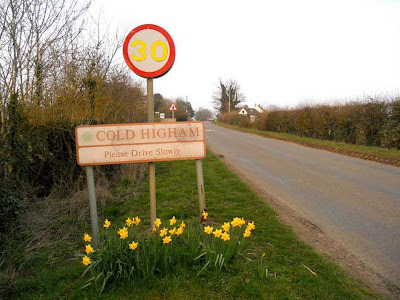 Telling visitors to the hamlet how many daffodils there are - a nice touch and a far better sue of the old yellow paint than double yellow lines and boxes. No alarm clock needed these mornings as the curious effect of the sloping field, walls and plain village weirdness is that the bleating of the new lambs, and some of the older ones for that matter, sound as if they're right outside my window. I suppose that, conversely, whatever noises I make may appear to them to be coming from very close-by too.